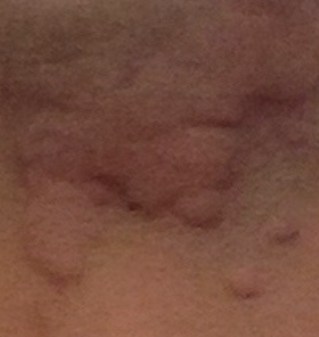 Acute urticaria is transient and does not last more than 6 weeks. When hives last more than 6 weeks, it is called chronic hives or chronic urticaria. Hives or urticaria is not a disease, but it is rather a symptom reflecting several underlying medical conditions or diseases. Thus, a multitude of triggers can cause a same presentation, which is hives. Chronic urticaria can be very debilitating and significantly affect your quality of life. To date, only a small percentage of chronic hives associate with certain systemic diseases that your physician need to look at. The majority of chronic hives cases are idiopathic, of which, about 20-50% has evidence of autoantibodies that can be detected by lab test. Chronic urticaria with positive autoimmune antibodies are called autoimmune urticaria. In area with high pollen count all year round like in Texas, it looks like most of chronic recurrent urticaria or hives in children and young adult are due to environment allergies. Rarely, food allergy cause chronic hives as evident in several studies. The goal of treatment of hives is not to use glucocorticosteroids or commonly known as steroids. Steroids are not the long-term treatment for chronic urticaria since its prolonged use carries significant side effects. There are several layers of steroid-sparing medications that can be used to manage and suppress chronic hives. Chronic urticaria clinic offers most up-to-date, state-of-the-art expertise and standardized approach in diagnosis and treatment for patients suffering from chronic urticaria. If you have or suspect to have chronic urticaria, please come for a discussion to see how we would help with our expertise in the field. Below are services and procedures we offer at Texas Allergy. Xolair® injection in case of failure to control symptoms due to all of those treatments mentioned above or due to significant side effects of using medications.